Our visit to the Hall Rutherford Estate has been one of the highlights of previous Napa Valley trips so we recommended it as one of the short list visits to son Ryan and Michelle for their recent Napa trip. 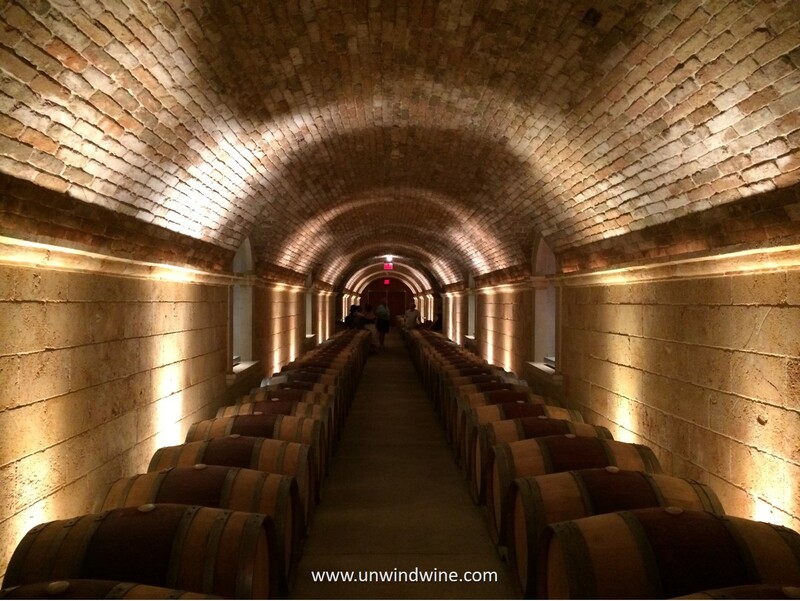 Based on his glowing report and recommendation, we decided to return to Hall for a tasting of their new releases during our recent Sonoma Napa Wine Experience 2017. 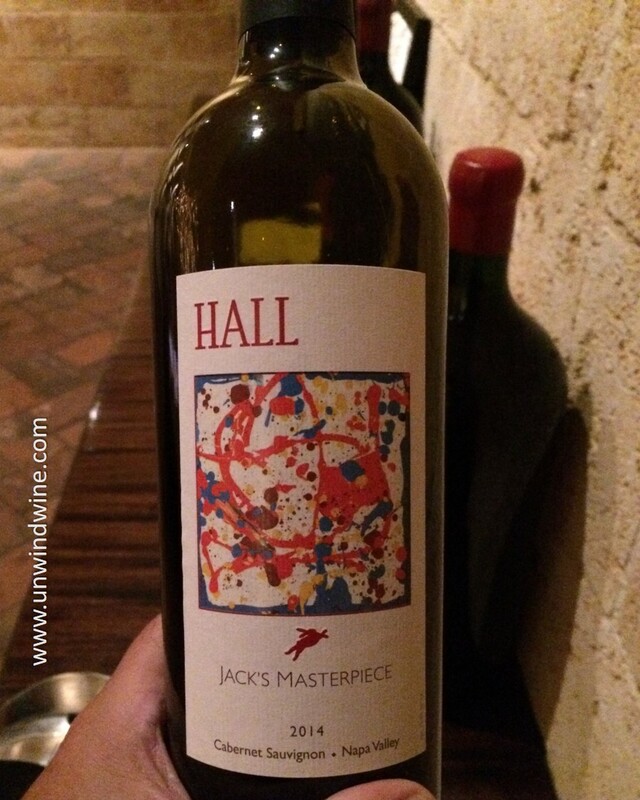 Like Del Dotto and some of the other top Napa producers, Hall have significantly expanded their operations, facilities, number of labels, and achievement of top ranked, most highly acclaimed ultra premium labels including the spectacular 99 and 100 point ranked wines which we tasted below. 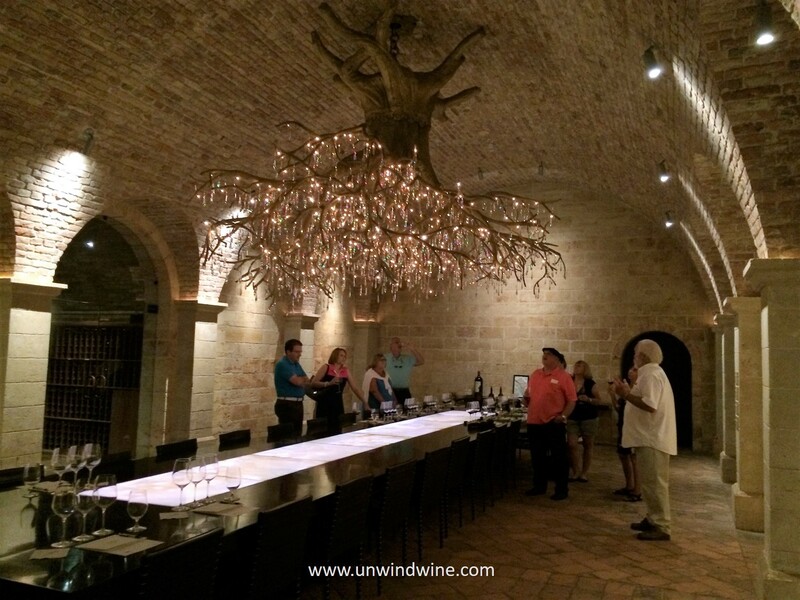 We wrote in earlier visit blogposts about the spectacular Hall Rutherford estate and cave tours at the Rutherford estate sitting in the Sacrashe Vineyard, above Auberge du Soleil Relaix au Chateau, below the Hall estate residence. 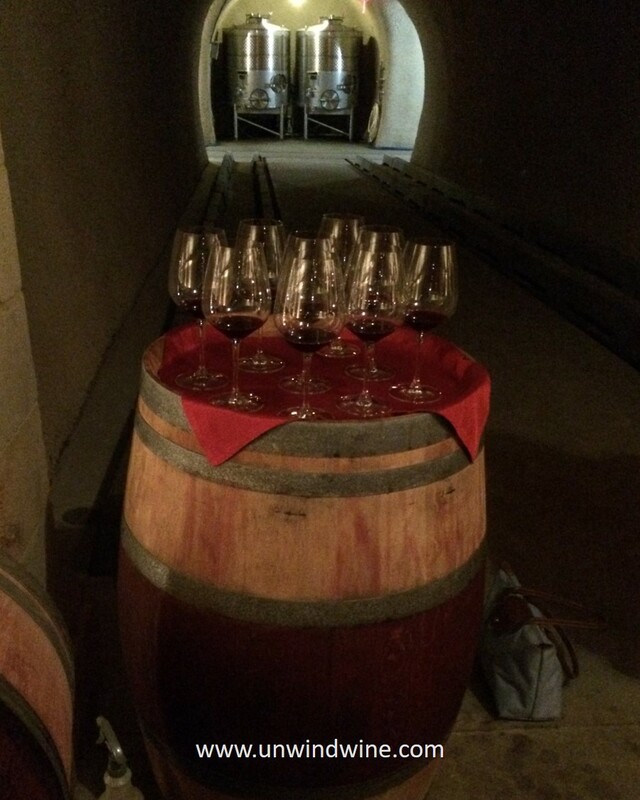 The facility has hospitality rooms above the wine production area, barrel caves and tasting room below. The magnificent caves are sculpted into the mountain with bricks brought from an Austrian castle and features alcoves that create a galley of sculpture art. The magnificent tasting room (shown left) at the end of the barrel cave features a large table for thirty guests underneath a massive chandelier fashioned from a thousand year old grape vine. We were hosted this day by 'Wine Educator' Bob Childs (pictured below). 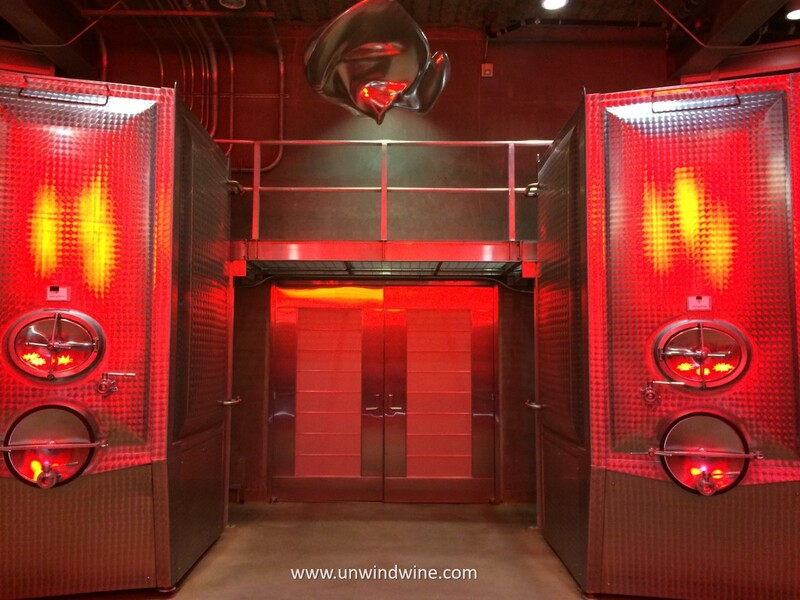 The lower level winery underneath the hospitality center houses the large stainless steel cooling jacket shrouded fermentation tanks. Even the production facility is bathed in the light of artistic neon lights overhead. 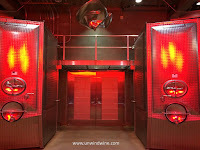 The custom built tanks are contoured to fit into the room. Centered between the adjacent rows of tanks are double doors that enter to the caves. The long barrel lined cave doubles as an art gallery with the many alcoves featuring sculpture artworks. At the end of the cave is the entrance to the tasting room. We tasted the Hall Appellation tasting flight featuring the latest releases of a selection the Hall premium and ultra-premium labels from the different Napa appellations paired with specially prepared appropriate culinary chef's selections. This is from the Hall St Helena Estate Vineyard in the St Helena appellation which surrounds the town in a crescent shape to the north, east and south. St Helena is also the site of Hall's large St Helena operations on Hwy 29 just south of town with winery, production, and a hospitality center that offers the range of Estate and Hall branded labels. The ultra-premium and Platinum labels are reserved for the esteemed Rutherford site. Winemaker Steve Leveque's notes: "The highly aromatic nose carries aromas of boysenberry, warm pie crust, brown spice, with floral and earthy undertones. Exotic flavors of wild berry coulis, 5-spice, black tea and cedar come through on the palate. Dense, lush and powerful tannins lead into a long and intensely fruity finish. It was fortuitous and fitting to taste a Diamond Creek appellation selection following our visit to the legendary Diamond Creek Vineyards on Diamond Mountain earlier in the week. Like Diamond Creek's, Hall's description of the Diamond Creek appellation speaks to the porous volcanic derived soils which are memorialized in the Diamond Creek single vineyard designated labels. Winemaker Steve Leveque's tasting notes: The flavors and aromas of this wine reveal a dusty and earthy character interwoven with notes of black cherry and German chocolate cake. Dense, silky tannins with a dark chocolate-like texture express age-worthy wine. The full power of this wine unwinds into a lengthy finish in the glass. 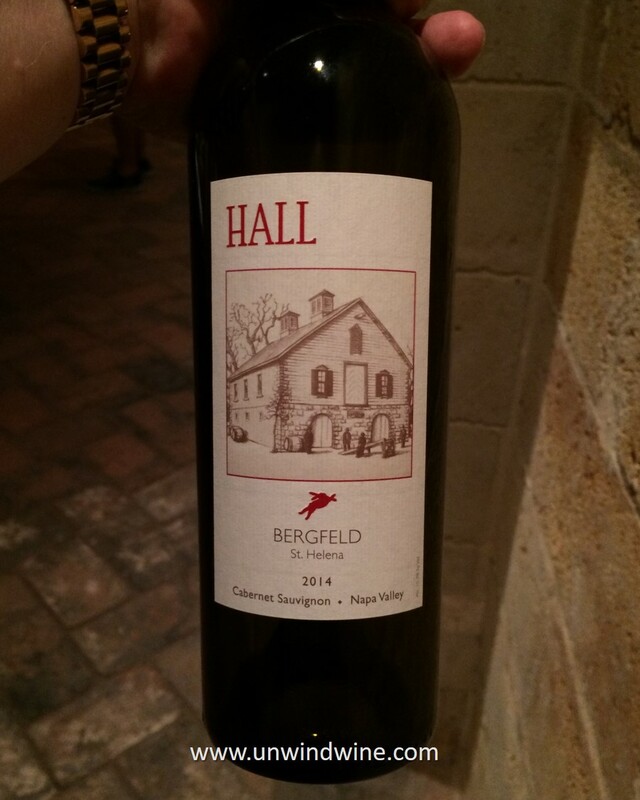 This wine was awarded 97 points by Robert Parker Wine Advocate. 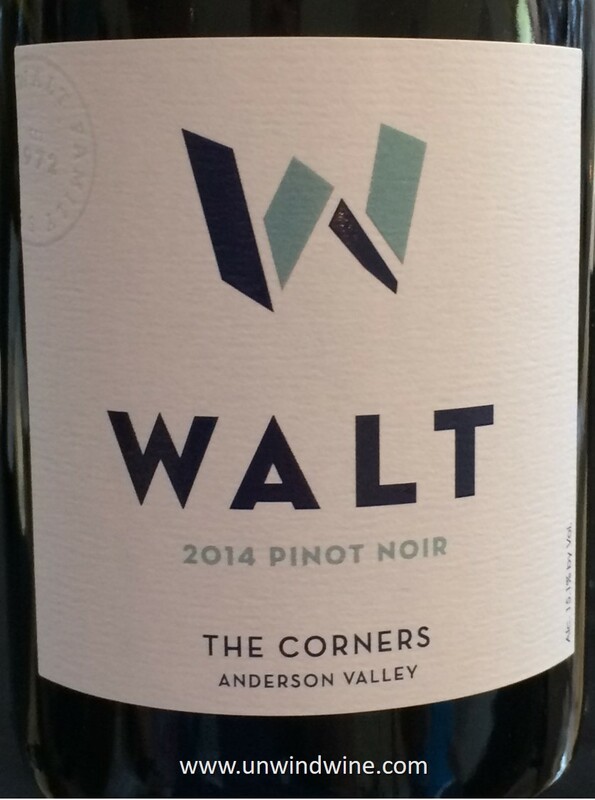 I plan to acquire the '15 vintage of this label and look forward to comparison tasting it against the Diamond Creek Vineyards releases we acquired this week. This is sourced from the Sacrashe Vineyard that lies just above the winery adjacent to the estate residence. We hold some of the earlier single vineyard designated wines from this vineyard dating back to 1998. Who knew this would evolve and progress to such heights? Not often does one get to taste a 'perfect' wine. of course perfection is in the eyes ('eyze') of the beholder. This wine got 100 points from Robert Parker. Parker wrote of this wine; "This hails from the foothills of Rutherford and refers to Kathryn Hall’s ambassadorship to Austria between 1997 and 2001. 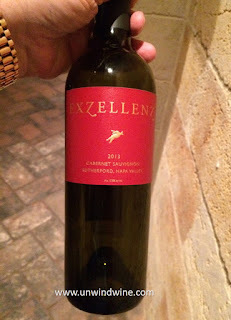 A prodigious wine with beautiful floral notes intermingled with blueberry, blackberry, black raspberry and graphite, the wine hits the palate with a full-bodied force, but nothing seems pushed, cloying or out of sync. Gorgeously pure blue and black fruits cascade over the palate, a full-bodied presentation with remarkable purity and complexity. The finish is a good 45-50 seconds, and while there is significant tannin, the extravagance of the fruit and glycerin generally conceal it. This is a remarkable, one-of-a-kind, world class Cabernet Sauvignon that should prove compelling for at least another 30-40+ years." Robert Parker, The Wine Advocate. 100 Points. Another 'perfect' wine by most anyone's standards, this one got 99 points from Mr. Parker, as close to perfection as possible. This was another memorable wine of epic proportions. Son Ryan obtained some '13 (birth year of his daughter (our grandaughter) Marleigh) during his recent visit, which is all gone. I'm planning to get the '15 on the upcoming release (birthyear of two grandkids, Jessie and Reid). "The 2013 Cabernet Sauvignon Jack’s Masterpiece, which is a blend from their finest vineyards, displays super-sweet tannins, an opaque purple color and beautiful crème de cassis, blueberry and blackberry fruit. Its flawless integration of acidity, tannin, wood and alcohol and its opulent, full-bodied mouthfeel make for a true elixir and fabulous Cabernet Sauvignon to drink now or cellar for 25-30 more years. I would still try to defer gratification for 2-3 years prior to drinking this big boy." 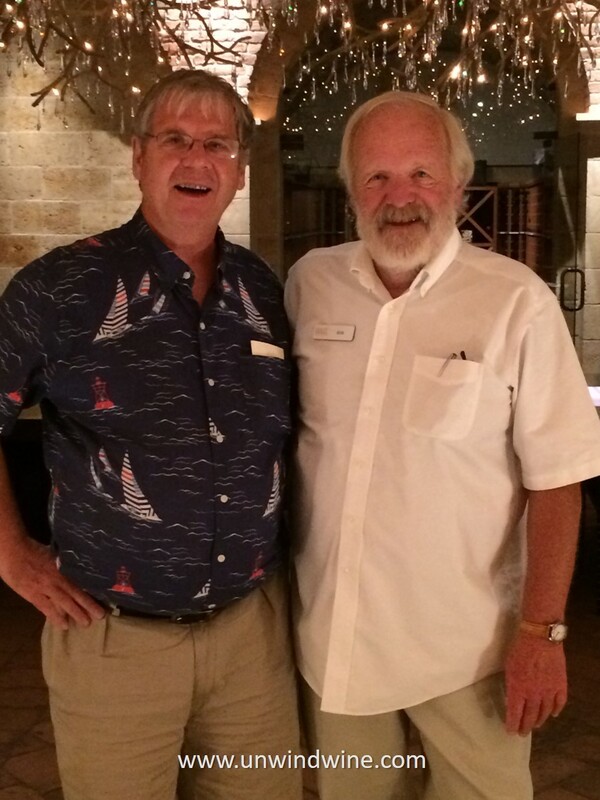 Robert Parker, The Wine Advocate 99 Points.